Leaders of the Church of Jesus Christ of Latter-day Saints (the Mormons) emphasize the importance of temple work. The significance of these buildings in Mormon theology cannot be overstressed. In fact, it is only by participating in the temple ritual that a faithful Mormon hopes to achieve exaltation or godhood. Though the Jews recognized only the Jerusalem temple as being God-ordained, the Mormons have built dozens of these special buildings throughout the world. However, unlike LDS chapels that are open to the public, entrance into a Mormon temple is reserved only for members who follow a strict code of conduct and are deemed worthy. The only time that the general public is invited to see the inside of a Mormon temple is during a brief “open house,” which usually precedes the dedication of the building. 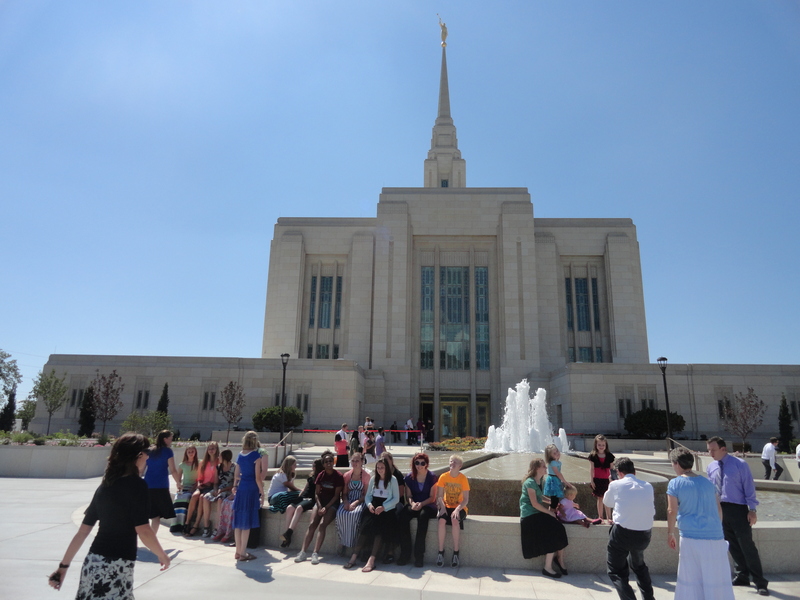 This article is specially prepared for those who may be interested in the Mormon temple ritual and its purpose as well as for those who plan to visit a temple open house in their area. Prior to your tour, you will be shown a brief visual presentation on the purpose and history of LDS temples. It is intended to give the impression that modern Mormon temples serve the same function as the Old Testament tabernacle in the wilderness (Exodus 25) and the temple in Jerusalem. The problem with this comparison is that it is not reasonably close to the truth. Both the tabernacle and the Jerusalem temple were used primarily for animal sacrifice. When given the opportunity, you might ask your tour guide why the film draws a parallel between Mormon temples and the Jerusalem temple when animal sacrifice plays no role in modern LDS temples. You may be directed to look atop the steeple to the gold-plated angel. Your guide may tell you that this is the angel Moroni (ma-roan-eye) who appeared to Joseph Smith, Mormonism’s founder, in 1823. Mormons believe that it was Moroni who directed Joseph Smith to the gold plates eventually “translated” into the Book of Mormon. The Book of Mormon states that Moroni is the son of a Nephite prophet/general named Mormon (from which the book gets its name). What may be overlooked is the fact that Smith was not always consistent when naming this angel. In relating this story in 1838, he claimed that the angel called himself Nephi, who was a completely different character in the Book of Mormon narrative. When the opportunity is available, you may wish to ask your guide why the 1851 Pearl of Great Price (p.41) and volume 3:753 of the Mormon periodical Times and Seasons (April 15, 1842) says it was Nephi, not Moroni, who appeared to Smith. It would be difficult to attribute the latter rendering to a “clerical error” given the fact that Smith was the editor of the Times and Seasons at the time his testimony was published. One of the first items you will see on your tour is the “recommend desk.” It is here that a Mormon (known as a “patron”) must provide his or her “temple recommend.” This is an identification card that demonstrates that the member has passed an examination by his or her local church leader and, among other things, has paid a full tithe, does not drink alcohol or coffee and tea, and abstains from tobacco products. What makes the concept of temple worthiness so unusual is that people in Bible times did not go to the temple because they were “worthy.” They went because they knew they were unworthy. Israelites saw the temple as a place where they could offer sacrifice on behalf of their sins. They realized all too well that they were unworthy sinners who needed God’s forgiveness. Based on this concept of worthiness, you might want to remind your guide about the story Jesus told in Luke 18:10ff. Here Jesus speaks of two men, a Pharisee and a tax collector, who entered the temple to pray. In Jesus’ story, which of the two men more fits the example of the Mormon? As you continue on your tour, you will be shown a large font on the back of twelve oxen. It is here where Mormons participate in proxy baptisms on behalf of deceased relatives and friends. Mormons believe that this act gives the deceased an opportunity to accept Mormonism in the spirit world; however, they have no way of knowing if the dead accepted or rejected the vicarious work. This font resembles King Solomon’s “molten sea” or “brazen sea” mentioned in 2 Chronicles 4:2. Tenth Mormon President Joseph Fielding Smith erroneously stated that this font was used for “baptizing the living for the remission of their sins” (Answers to Gospel Questions 5:18). However, Mormon Apostle James Talmage correctly noted that the “molten sea was reserved for the ceremonial cleansing of the priests” (The House of the Lord, p.34). What you won’t be told is that this design was used only for a relatively short time. According to 2 Kings 16:17, King Ahaz removed the font (or laver) from the backs of the oxen and placed it “upon a pavement of stones.” Even though you may be given the impression that this font was used during New Testament times, it was actually destroyed by the Babylonians when they captured Jerusalem in 586 B.C. Second Kings 25:13 states that the remaining pieces were carried off to Babylon after it was destroyed,. This design was never used again. It is not uncommon for the Mormons to place a sign next to the baptismal font citing 1 Corinthians 15:29. While scholars have debated as to what the apostle Paul was referring to in this passage, one thing is certain: Paul actually separated himself from such a practice when he said, “Else what shall THEY do which are baptized for the dead, if the dead rise not at all? Why are THEY then baptized for the dead?” If baptism for the dead was in fact the “most glorious of all subjects belonging to the everlasting gospel” (D&C 128:17), it seems odd that Paul would not include himself as a participant. There is absolutely no evidence to suggest that baptisms for either the living or the dead ever took place in the tabernacle or the Jerusalem temple. You might also find it interesting that Mormons have been vicariously baptized for such people as John Wesley, Martin Luther, Abraham Lincoln, William Shakespeare, Albert Einstein, Christopher Columbus, and yes, even Adolph Hitler! You may wish to ask your guide why modern LDS temples have a replica of the molten sea when no such edifice was ever used in the New Testament. If the Mormon temple ceremony is really a restoration of things done anciently, why is this? Tours often allow the public to view the locker rooms. There are separate facilities for men and women. Here patrons change from street clothes into temple clothing. It is also in this area where the washing and anointing rooms are located, though you will probably not be permitted to see them. These special cubicles are to ceremoniously wash and anoint temple patrons who are entering the temple for the first time. These special cubicles are used for the washing and anointing ceremony, a vital part of the personal endowment. When going through this part of the ritual, temple patrons wear only a piece of fabric covering called a “shield.” A temple worker then ceremoniously “washes” and blesses the patron, making reference to various parts of their body. Prayer is offered on behalf of the patron, and the ritual is repeated with the anointing of olive oil. Perhaps you can ask your tour guide why you were not shown the washing and anointing rooms. Patrons have placed upon them the “garment of the holy priesthood” during the ritual Sewn into this garment are special markings. Over the right breast is a mark that resembles a backwards L, and over the left breast is a mark that resembles a capital V. Another marking that looks like a short horizontal line is sewn over the abdomen and over the knee. Mormons are told in the ceremony that this garment can actually protect them. Twelfth President Spencer Kimball taught, “I am sure one could go to extreme in worshiping the cloth of which the garment is made, but one could also go to the other extreme. Though generally I think our protection is a mental, spiritual, moral one, yet I am convinced that there could be and undoubtedly have been many cases where there has been, through faith, an actual physical protection, so we must not minimize that possibility” (Teachings of Spencer W. Kimball, p.539). You may wish to inquire of your tour guide why Mormons seem just as vulnerable to death in car accidents, etc, as those who do not wear this special piece of clothing. You might also ask where in the Bible Christians are told to expect protection from a piece of clothing. Another unique aspect of the Mormon temple ritual is the special name given to each patron. A couple of men’s names are selected and given out alternately throughout each day. The same is true for the women. Normally they are names found in either the Bible or Book of Mormon. Historically, Mormon leaders have taught that the husband has the ability to call his wife from the grave on the resurrection day by using this special name. According to Charles Penrose, who later became a First Counselor to President Heber J. Grant: “In the resurrection, they stand side by side and hold dominion together. Every man who overcomes all things and is thereby entitled to inherit all things, receives power to bring up his wife to join him in the possession and enjoyment thereof” (Mormon Doctrine Plain and Simple, 1888, p.51). You might wish to ask your tour guide what happens to the wife should the husband forget her temple name. Your temple tour will include a stop in one of several ordinance rooms. In newer temples these have the appearance of a mini-movie theater. Here patrons watch a film on the Mormon view of the creation and fall of man. It is in one of these rooms where patrons will be taught secret handshakes and passwords known as “tokens” and “keywords.” It is very necessary that the Mormon become familiar with these handshakes and passwords; otherwise they will not be able to gain entrance into the presence of their God. Second LDS President Brigham Young taught, “Your endowment is, to receive all those ordinances in the house of the Lord, which are necessary for you, after you have departed this life, to enable you to walk back to the presence of the Father, passing the angels who stand as sentinels, being enabled to give them the key words, the signs and tokens, pertaining to the holy Priesthood, and gain your eternal exaltation in spite of earth and hell” (Discourses of Brigham Young, p.416). You may wish to ask your tour guide to explain the use of these tokens and keywords. You might also ask your guide where in the Bible it teaches that entrance into heaven depends on secret handshakes or passwords. Isn’t faith in Christ enough? Marriage is very important in Mormon theology. In fact, it is only by being married that a Mormon can hope to get the best his religion has to offer. Brigham Young taught that if a man wishes to be saved, “he cannot be saved without a woman by his side” (cited in Kimball’s The Miracle of Forgiveness, p.245). However, a marriage that ends at death is not good enough. Mormons also believe that marriage can extend beyond the grave. They emphasize being sealed together for “time and eternity.” This ritual takes place in what is known as a “sealing room,” which are rather small in comparison to some of the other rooms in Mormon temples. They consist of several chairs surrounding a kneeling bench in the middle of the room. One of the primary desires of faithful Mormons is to be sealed to their families for eternity. However, this is a conditional promise based on individual faithfulness. If a family member does not keep all the laws and ordinances of the Mormon Church, this person will not achieve exaltation in the Celestial Kingdom and will be barred from reuniting with family members. This holds true for husbands and wives. Despite having been sealed in a Mormon temple, the Mormon’s ability to be married in eternity is only on condition of complete obedience to God’s laws. You might offer your tour guide the following hypothetical situation: A man marries his first wife in the temple, but sadly, she later passes away. He remarries a second time in the temple and finds that he would much rather spend eternity with the second wife. In eternity to whom will he be sealed? You might also ask why there is no biblical or historical evidence to support this belief. It should be clear that the Mormon Church is very misleading when it draws a comparison between its temples and the biblical model. There is actually no comparison at all. Instead, much of what goes on in Mormon temples more closely resembles ceremonies common in Freemasonry. This would make perfect sense since Joseph Smith became a Mason on March 15, 1842 (History of the Church 4:550-551). Shortly after his initiation into Masonry, he instituted the Mormon temple endowment ceremony. Please be advised that there is much to Mormonism that will not be explained on your temple tour. Be wise and examine this religion very closely. Not all groups that claim to be Christian actually are Christian. For more on temples, click here.